December has finds from November as well as search and finds from various places around the house. 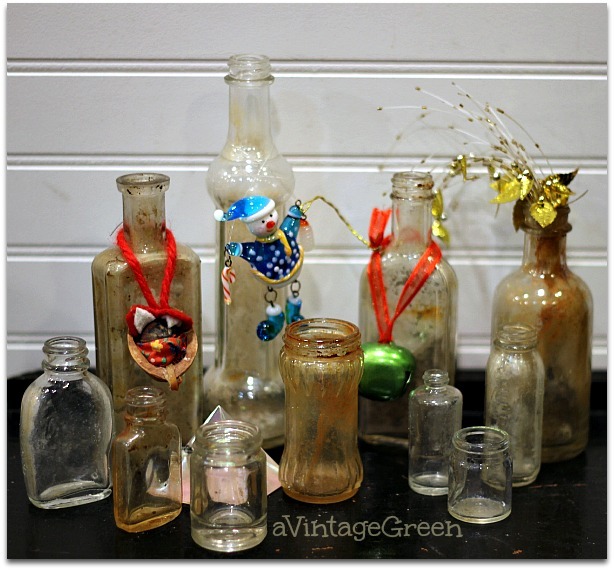 The glass bottles (way below) have been in my collection for a few years as have the silver plate bells (last picture). I love adding seasonal decorations to thrifted items. 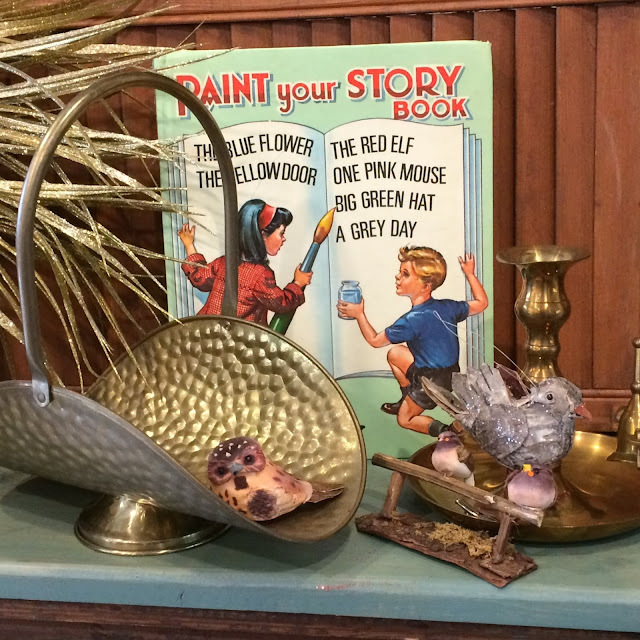 Vintage Paint Your Story Book (1969) along with a small brass long matches holder and a brass candle holder with a snuffer. 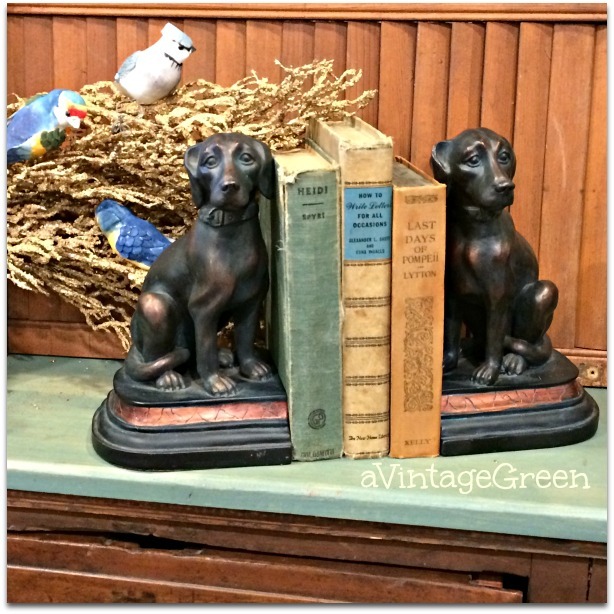 Dog bookends with somewhat sad faces along (holding some lovely vintage books) with some blue feathered birds on gold coloured branches. 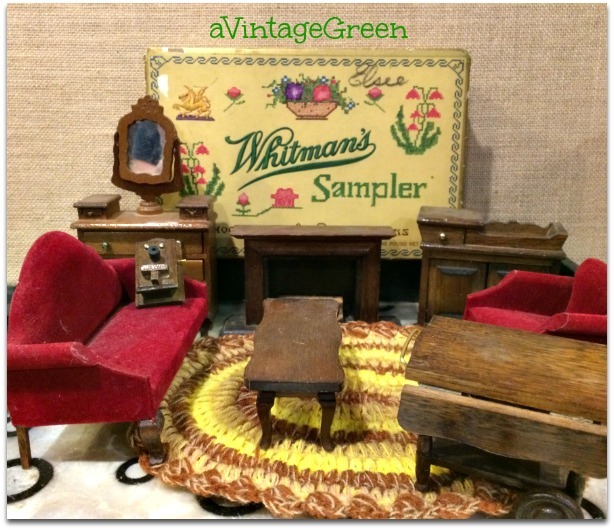 Fun find was doll house furniture. I will admit I played doll house rearranging for quite some time. Dump dug old bottles still with the dried mud. Great earth stains, added a few decorations. Always a treat to find ship pictures, this was one of four. 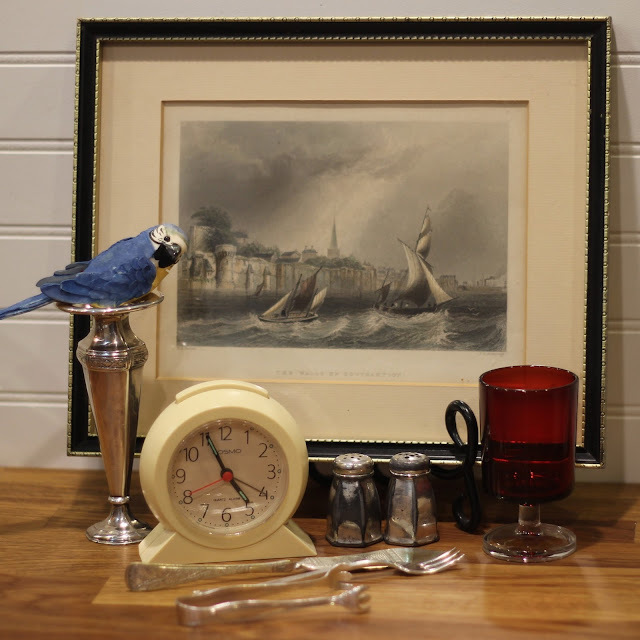 The silver plate and the cream colour Cosmo clock has an old look (not old though). 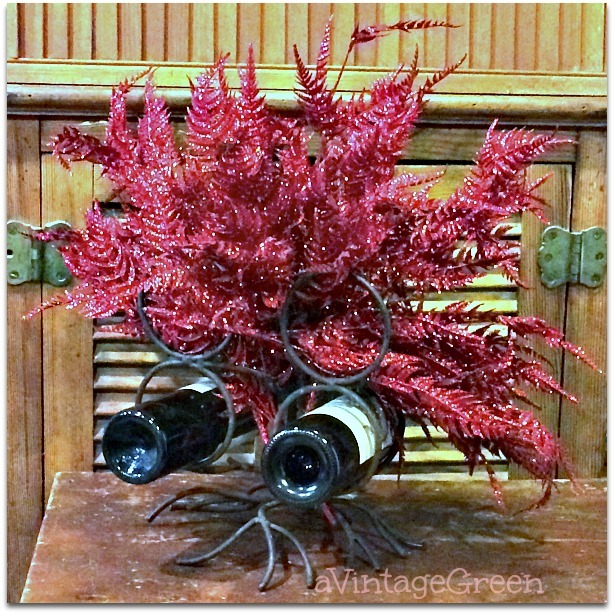 Metal wine bottle holder (holds 4) with some Christmas sparkle. 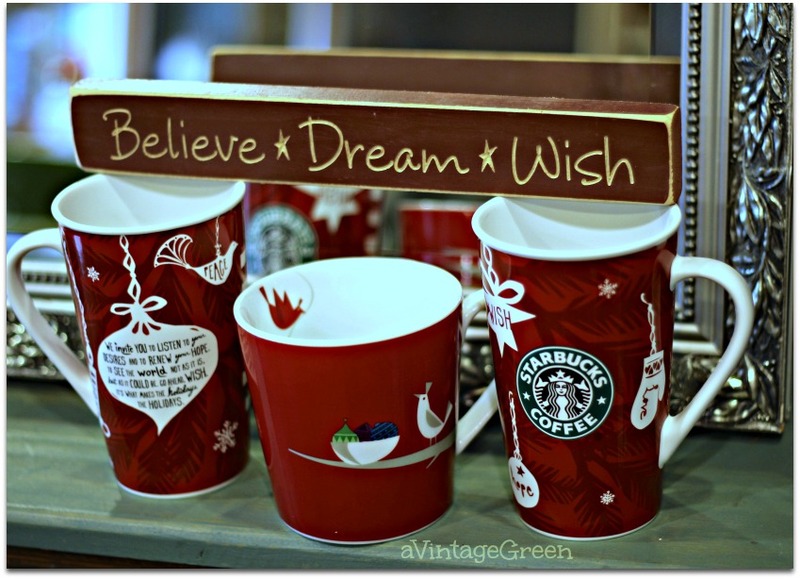 Found three Starbuck Christmas Mugs at a great church flea market sale. Great organization, definitely going back next year but I will arrive much earlier, parking was non-existent for about 3 blocks around the church, very, very well organized sale. Lots of parishioners wearing vests with name tags saying what their job was (security, holding parcels for pickup, sellers), long line up waiting for 9 am. The bells did need some silver polish. I bring them out every year. This year the bells with red ribbons lost their ribbons (jingle bells excepted). Slowly pulling together the treasures I want to share for Christmas. Who would have guessed that there would be a sun shine, no rain morning on December 3 - and a garage sale ! Added another worn out hand saw to my collection of stencil projects. I picked up a small bag of 1 1/2" nails and a small container of nail-tacks from the free table too. I have made a small start on Christmas decorating and a few areas are finished, still many areas to work on, looking forward to sharing on Home For Christmas with Brenda of Cozy Little House and Debra of Common Ground for their party on Tuesday December 13th. See you on Tuesday 13th (next post). PS: did anyone besides my sister (and me) notice that my blog was frozen out? No front page just a page saying the domain was available and a list of similar suggested domain names? Took me 3 days to make contact with the right person who solved my problem in 1/2 hour and I was 'live' again. I may write a post about this later. Blogger and domain name and credit card date change. It was all my own problem too because I didn't check my emails (3 were sent) from Blogger saying I needed to update my billing information). I read every new post and really enjoy your blog, so I definitely noticed it was unavailable. So glad you're back! Love these displays! That one of the winerack is hilarious--very good, Joy! You certainly find lots of great stuff in your area. Your staging skills are just amazing. (Joy, if this is my third comment, please delete the extras ... I'm having 'puter problems this morning.) Loved this post. 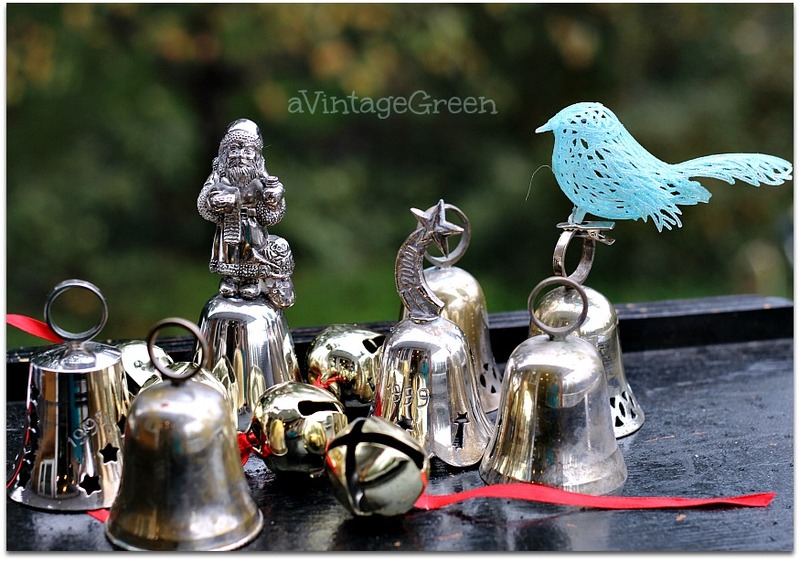 Bells at Christmas are wonderful. The Whitman Sampler brought back sweet memories. My Daddy always brought home a sampler every Christmas for everyone to enjoy. Love the dog bookends, too. You find the best "stuff"! Merry Merry! Such beautiful things. You have a great eye. Lots of goodies! Hope you are doing well and enjoying getting into the holiday season. 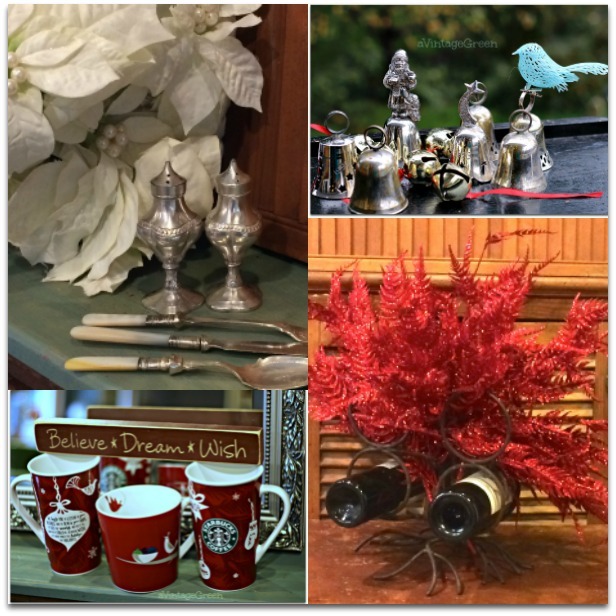 You have found some great old items! I look forward to seeing your home tour soon too. The doll furniture is a very fun find! And I love your old books...Heidi is my favorite. I remember my Grandmother reading Heidi to me one summer! Happy holidays! Glad to hear that the gremlins have been defeated and that all is well on your blog now, we missed you at MM last week. 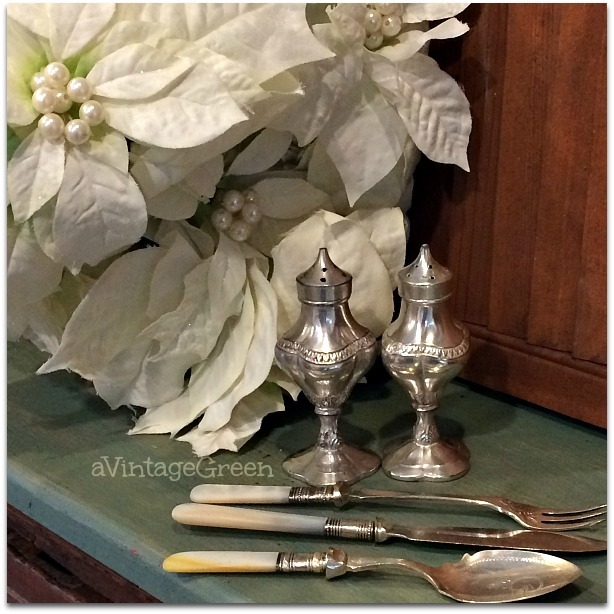 I love your white faux poinsettia, I want one too! Good morning Joy, No one does a vignette like you. 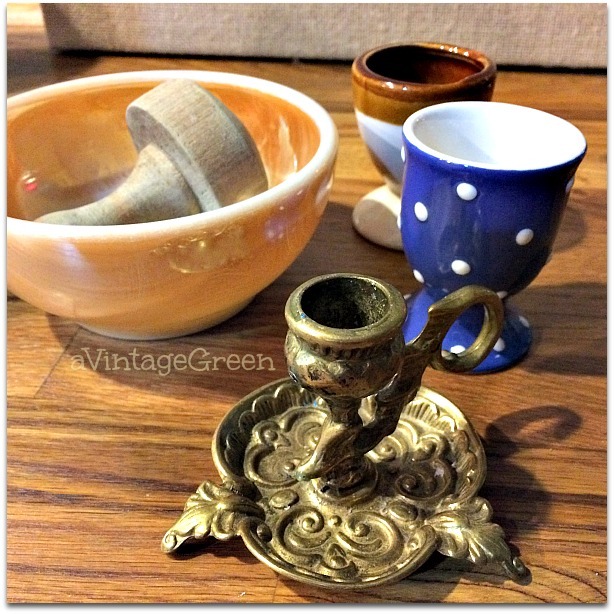 As a past antique dealer, I so appreciate your love of vintage treasures. The wine holder idea is something I will do. Love the birds in your vignettes so much. You are a great finder of the very things I would love. Happy Blue Monday and Christmas decorating. Thank goodness we are done. I have many vintage things. Truly enjoyed seeing some of yours. So many pretty things, Joy. The silver bells are my favorite, so I pinned them! Thanks for sharing @Vintage Charm! How fun! I love thrift store finds! 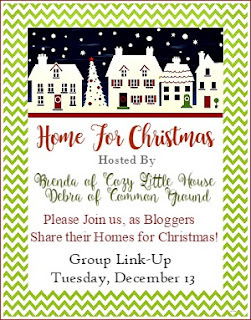 Thanks for sharing with us at Funtastic Friday Blog Hop!